Forty-one years after Lee "Scratch" Perry defined dub music with his seminal 1976 Super Ape album, he returns with NYC's Subatomic Sound System to conquer again, reincarnating the magic of his Black Ark studio in Jamaica, heavy on Ethiopian horns and percussion, while reinvigorating it with the 21st century booming bass and beats that capture the energy of their innovative live electronic show. How do you improve on a masterpiece? 41 years after Lee "Scratch" Perry defined dub music with his seminal 1976 Super Ape concept album, the musical genius at the age of 81 returns with NYC's Subatomic Sound System to conquer again, reincarnating the magic of his Black Ark studio in Jamaica, leaning even heavier on Ethiopian horns & percussion, while invigorating it for urban jungles with booming Subatomic beats and bass to capture the energy of their innovative live electronic show and crystalize for the new millennium why the album was a cornerstone in the development of independent, producer fueled, beat and bass driven music. To say that Super Ape defined dub, is to say that it created a blueprint for where most music has arrived 41 years later when it now is commonplace for a producer to be considered an artist, work from a home studio, sample and remix existing songs, and have the beat and bassline at the forefront of the song, perhaps replacing singing with rhythmic talking or with echoes and effects and no vocals at all. In 1976, it was unheard of, unimaginable, and even unacceptable to many, but Lee Perry did it and now it is commonplace from electronic music to trap. More than a re-creation, this new album breaks ground of its own; first, for its fluid combination of improvisational electronic performance with live instruments in a way that finally sees instruments and computers dynamically interacting like a live band should, while simultaneously being mixed like a studio recording (rather than live instruments simply playing over static backing tracks); and secondly, it blurs the line between a live and studio album, combining elements from tour performances based on the original studio album with new tempo synced studio recordings to get that “lightning in a bottle” chemistry of the moment. “Every night, we set up a sort of digital studio on stage as an instrument in the band, taking Scratch’s whole process of dub mixing out of the confines of the studio and onto the stage so that instead of just hitting play, it allows us to remix and arrange the music in real time in a way that is not unlike a like a jazz solo. That is how we create the live show, but it also allows us to take it back into the studio to create an album with that same live energy and spontaneity,” says Emch. SONGS The compositions alone make this album worth revisiting. Created just after Scratch broke off working with Bob Marley & The Wailers, having written and produced what many consider some of the greatest songs of the century (Sun Is Shining, Kaya, Natural Mystic and dozens more), Super Ape included dub versions of two more of reggae’s most enduring songs “Chase the Devil” and “War Ina Babylon” that Scratch had recorded with Max Romeo, which on this new album, combine unique elements of their 1976 Super Ape dub versions with the original vocal versions. Songs like “Zion’s Blood”, “Dread Lion”, and “Super Ape” are heavy spiritual meditation vibes but now turn up the throbbing bass pressure to 11 and extend the improvisational style of Ethiopian jazz hinted at in the horns on the originals. The ganja tune “Underground Roots” originally mostly instrumental, features Ari Up, pioneering singer of the first all-female UK punk band The Slits, joining Scratch on vocals for an exploration of the metaphor of underground roots and culture. Sadly, it seems this was Ari’s last recording, shortly before she passed away, recorded not long after her live performance with Scratch, Subatomic, & Lee Perry in NYC. “Curly Dub” features a bold steppers beat and unlikely swaggering jazz bass line that gets turned up and taken on a psychedelic trip back to Africa. Also heavy on the jazz influence, Patience features horns and bass you might expect to be sampled on a classic hip hop record. Meanwhile, “Come Along” and “Three in One” deliver the pure feel good reggae vibes made famous by Scratch for transporting you straight to sunny Jamaica. Both songs feature new chatting verses by Screechy Dan summoning the vibes of Jazzbo or U-Roy as a tip of the hat to the fact that Scratch was the first to ever record chatting on a song. Chatting over dubs at sound system parties was the precursor to what would later become rap music in the Bronx. “Three In One” extends the falsetto soul singing of the original recording to hint at the influence of American soul singers like Curtis Mayfield on Scratch’s music. Several entirely instrumental dub mixes are included both for DJs making dubplates for their sound systems as well as for listeners to get a better ear on the subtle layers and textures in the compositions. 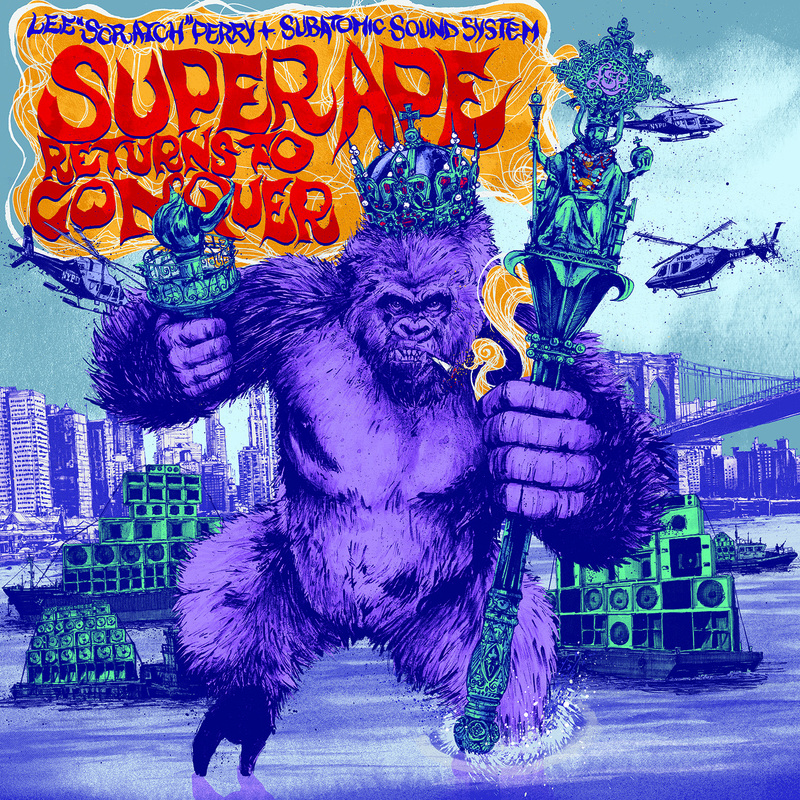 PERFORMERS To stand up to the original, the quality of performances on “Super Ape Returns to Conquer” needed to be second to none and after 7 years supporting Scratch on tour and over a year of Super Ape album concerts, the Subatomic Sound System crew came with their “A” game. Scratch loves rhythm and drums and his recordings were known for their dense and unique percussion, and on the new album that is handled by none other than original Black Ark studio percussionist, Jamaican conga legend Larry McDonald. Like Scratch, Larry is an octogenarian who has spent a lifetime making music and is known also for his work with Peter Tosh, Bob Marley, Gil Scot Heron, Toots, The Skatalites, Taj Mahal and even Bad Brains. On vocals, Screechy Dan hailing from Kingston, Jamaica and one NYC’s greatest reggae singjays to emerge from the 90s Brooklyn dancehall scene in the crew with Shaggy, Red Foxx, & Rayvon, covers nearly all the singing, harmonies, and chatting, front to back. Jahdan Blakkamoore expertly handles the famous “Chase the Devil” intro and punky reggae pioneer Ari Up of the Slits appears on “Underground Roots”. On the horns, Troy Shaka Simms (Brooklyn Gypsies) & Omar Little deliver a barrage of sax, trumpet, and cornet lines and solos tracing their roots from American jazz to Jamaican reggae all the way back through Africa and the Middle East. During live shows, Emch plays the melodica and handles all the dub mixing of live instruments and stems as well as arrangement of all the music in Ableton, but off stage he creates all those rhythms from scratch, note for note, programming beats, playing guitar, keys, basslines, samplers, sirens and any other unusual sounds or effects that can’t or won’t be interpreted by other performers during the show. During sessions in Jamaica, as he is famously known to do, Scratch was sure to add his own sounds like cutting scissors, banging rock stones, lighters lighting, fire crackling, burning paper, and smashing a glass chalice. PRODUCTION & MASTERING In producing the album, Emch was sure to balance the digital and analog sound, representing the best of both worlds to capture Scratch’s Black Ark vibes for the 21st century. That involved a balance of live instruments and electronics as well as a combination of analog and digital recording tools and effects. When it came to mastering, he teamed up with Daniel Boyle in the UK who produced Scratch’s Grammy nominated 2015 release “Back At The Controls” after outfitting his studio with all the same gear Scratch had at the Black Ark. A frequent lecturer at Abbey Road Studios on using analog gear in the unorthodox context of dub, Daniel has assembled a vast array of analog gear at his Rolling Lion studio to rough up the digital edges of the recordings and make the ape a little hairier while Emch used digital gear back at Subatomic Sound in NYC to get the final levels and frequency response in line with current bass heavy records. For those unable to listen to the album on a proper full frequency sound system, Emch worked with SubPac to optimize the recording for their wearable sub bass devices so people can feel the bass in a way that emulates the tactile experience of hearing it on massive bass bins. 81 YEARS AGO The new album opens with Perry announcing, “I’m walking in water right now” while striding out of the ocean in Negril, a stones’ throw from his birthplace 81 years before. A Pisces who claims his father is King Neptune, Perry says that every night while he sleeps, he turns back into a fish. In the day, his boots are his boats, transporting him over the earth. Climbing out of the ocean and into a tree, Perry bangs stones together and swings from a branch shouting “Super Ape!” three times loudly. He then announces that reggae was his ransom which he gave away to Bob Marley in exchange for the freedom to develop his next great idea: Dub! Without the crossover promotional financing that catapulted Bob Marley and reggae to the forefront of global consciousness in the 70s, dub has had a slower grassroots development that eschewed commercial success, but instead germinated in the hearts and minds of musicians and producers across nearly every genre from hip hop to electronic music to punk rock. And while reggae struggles to find a successor to Bob Marley, the blueprint for dub has slowly grown and grown until it has essentially become the fingerprint of current popular music these days: music where the producer is the artist creating music from their own home studio, the beat and bassline are at the forefront, and the vocals can find themselves secondary or even substituted entirely with various effects and samples driving the track. where we arrived.” He followed that up with a Kickstarter to raise money for a 14 foot custom inflatable Super Ape that went viral with write-ups in nearly every imaginable music press outlet. Every show on the Noth America tour sold out and led to invitations to headline the Telerama Dub Festival tour in France, High Vibes Festival in Jamaica, Ozora psychedelic electronic festival in Hungary, give the keynote lecture at Ableton’s Loop Berlin festival and others – breaking far outside the typical realm of reggae music. Level unlocked! THE ARTISTS Grammy winning reggae and dub inventor Lee “Scratch” Perry is a living legend, one of Jamaica’s most prolific producers and a true original with a spirit that has defined and influenced countless artists across genres and generations, decades of great Jamaican artists from Bob Marley to Max Romeo, punk rockers The Clash, The Rolling Stones’ Keith Richards, The Orb, The Beastie Boys, Paul McCartney, Kode9, and the list goes on. At 81 years of age, he continues to tour, record, and paint relentlessly. Lee “Scratch” Perry has built a life based as much on his fame as the reggae and dub inventor who exhibited boundless creativity and innovation in music composition and production, as he has on his reputation as a madman with playful wit, a propensity for lighting things on fire, a natural mystical spirituality that he famously instilled in Bob Marley, and his defiant individuality and commitment to personal freedom. Keith Richards called him "the Salvador Dali of Music", Bountry Killer recently hailed him as "the greatest Jamaican artist of all time", and Basquait cited him as a significant inspiration for his paintings. Perry has always loved to dance and his nickname comes from the name of dance he invented for his first recorded single, “Chicken Scratch”. Spearhead by producer, DJ, and instrumentalist Emch, NYC’s Subatomic Sound System is on the front lines of a dub music renaissance: founder of the US & Europe Dub Champions Festival, 7 years acting as the live touring band for legend Lee “Scratch” Perry, spearheading the 40th anniversary Super Ape tour for Dub Champions Festival, as well as performances including Coachella, Red Bull Music Academy, Ableton Loop Berlin, Ozora and more; plus independently touring North America, Europe, and Asia, and for over a decade producing music ranging from classic roots dub to dancehall to dubstep all with a heavy NYC flavor. THE SUBATOMIC SOUND LABEL Subatomic Sound specializes in limited releases that push the envelope of dub, reggae, & dancehall in the context of electronic bass music through forward sounding productions and unlikely collaborations with icons such as Lee “Scratch” Perry, David Lynch, Anthony B, Elephant Man, Ari Up of The Slits, as well as new school torchbearers like Dubblestandart, Jahdan Blakkamoore, Delhi Sultanate, Stereotyp and many more. Subatomic Sound actively produces events and founded the annual Dub Champions Festival running 7 years in the USA and Europe. Subatomic Sound Radio airs on Brooklyn Radio and for three years ran on KEXP’s Radio New York, 91.5FM broadcast which transmitted to a footprint of 11 million listeners. Last updated September 22, 2017.